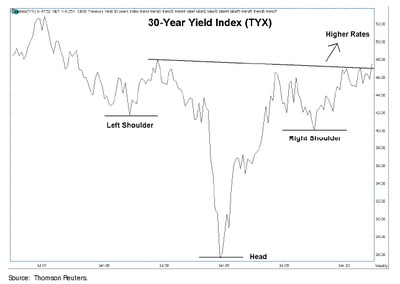 The latest from Raymond James strategist Jeff Saut nicely encapsulates what we think is how a lot of investors are thinking. It’s hard to not like stocks, but those rising bond yields are tad worrisome. Let’s hope we’re not looking at some canary in the coalmine. Speaking to the stock market, while the intermediate/longer-term outlook remains positive, the shorter-term environment continues to counsel for caution. Granted, we may be “talking” our position, having been too cautious since recommending that strategy on March 15th with the SPX at 1150. However, as Charles Dow stated – The successful investor needs to be able to ignore two out of every three money making opportunities. (see chart). As repeatedly stated, we think this “higher rates” mindset is what’s behind the U.S. Dollar Index’s strength as it broke out to new reaction highs last week. We also believe both of those events are responsible for the Reuters/CRB Commodity Index’s weakness.